I’m not exactly sure where I first came across bostock, but I believe it was at either salon.com or the kitchn.com. This take on baked French toast does seem to be of French origin, but I can’t determine how it got its English sounding name, and I’ve never seen it on a local menu. But even online, it was love at first sight. Bostock, or “brioche aux amandes,” is a delicious way to use up brioche on the verge of staleness, should you actually have that kind of problem in your kitchen. But believe me, it’s worth buying a loaf or rolls of the rich, buttery bread just to make this dish. 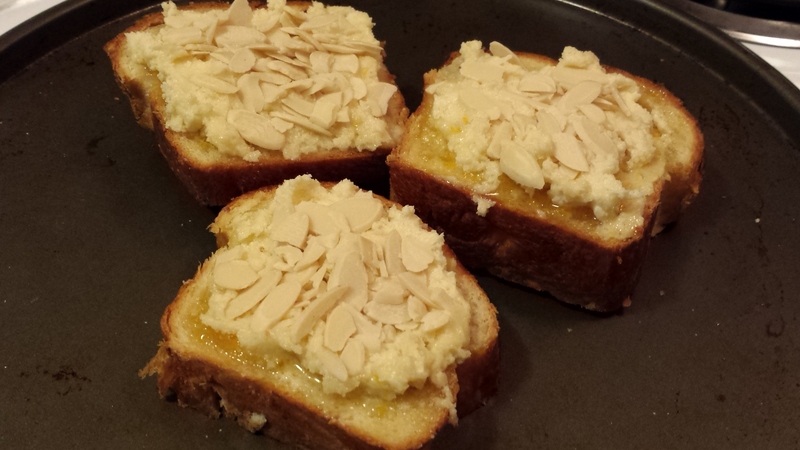 Fat slices are brushed with syrup, slathered with almond cream, and then topped with sliced almonds. Slide it into the oven until the almond cream puffs up and browns, and you’ve got a terrific pastry that will win accolades from family and friends. For entertaining, it’s easy to make trays of it ahead of time to serve at room temperature. Although I have hundreds of cookbooks, none of them seem to have a recipe for this dish, but there are many online, including a walnut/fig version from last September’s Bon Appétit magazine. It’s one of those dishes that you can read up on, and then “make your own,” as I did. The recipe below is a mashup from several sources. I’ve annotated it to show some of the variations you might want to consider. Feel free to adapt the flavorings as you like. Most versions, including one credited to Pierre Hermé in Paris, include orange flavoring in the syrup. (I notice that their website currently offers a lemon-hazelnut version.) Other recipes omit that or go whole hog by adding a teaspoon of orange flower water and a little orange juice along with the zest. I also found recipes that use brown sugar instead of white in the syrup, and one that adds a touch of honey, too. Some renditions make the almond cream (or “frangipane”) with ground almonds, but others use almond paste, which can be purchased in cans or tubes. Just don’t use marzipan, as it is too sweet here. I do like the addition of almond extract for more pronounced flavor, but feel free to use half almond and half vanilla extract if you think you might like that better. Another way to vary this dish is by spreading a thin layer of jam (bitter marmalade, blackberry, maybe ginger preserves?) after brushing on the syrup but before spreading the almond cream. Don’t be put off by the number of components in bostock. It’s easy to make the syrup and almond cream ahead of time, and they’ll keep in the fridge for weeks. Then, whenever you want, you can assemble a batch in minutes. I call that downright dangerous. While you could substitute egg-based challah (although it lacks the butter that’s in brioche), I have seen brioche loaves and rolls at Whole Foods recently (near the cheese/coffee counter), plus Wegmans makes decadent craquelin brioche, which is what I used here. Better bakeries make brioche dough in house for their pastries, as does The Gingered Peach in Lawrenceville, but may not normally have it on hand in loaf form. But they’re happy to take a special order, as are gourmet markets like Lucy’s Kitchen and Market in Princeton. F.B. Almond cream: Cream butter and sugar together until light and fluffy. Mix in almond meal. Sift in flour and cornstarch; mix to combine. Add egg and mix until even and smooth. Add liqueur and extract. Chill for a while, covered, to firm up slightly; until ready to use. Syrup: In a small saucepan mix together sugar, water and lemon juice, bring to a boil and simmer until syrupy. Turn off heat. Add zest, liqueur, and extract. Set aside to cool. Assemble: Preheat oven to 350 degrees. Slice bread into 3/4- to 1 1/2-thick slices, or set halved rolls cut side up. Brush with syrup. Spread 2-3 tablespoons almond cream on each slice, spread not quite to edges. Top with almonds, pressing them gently. Bake 15-20 minutes, until puffy and golden. Cool on a rack 8 minutes (if you can wait that long!). Dust with powdered or pearl sugar. Serve warm or at room temperature. Faith, could it be that my mention of Bostock months ago, and my shortcut process, triggered your interest?? My intro to Bostock was at the Essential Baking Company cafe (Seattle). Along with their almond croissant I was hooked on their products. Unfortunately neither of those pastries are available there now. But, if anyone happens by Seattle the Grand Central Baking cafe on East Lake Ave has similar pastries of wonderful quality. Also, Le Fornil, a true French patisserie, also on East Lake, but farther north, makes an Almond Brioche pastry based on a slice of brioche loaf with the rest of the process much the same as for Bostock. If you are interested in my short cut I’ll pass it on. “Zio” Alex. I do remember (and saved) our exchange, I did already have bostock on my radar then, and commented, ” I have saved several links to Bostock because it is clearly French Toast CRACK.” All too true! Great article, Faith. 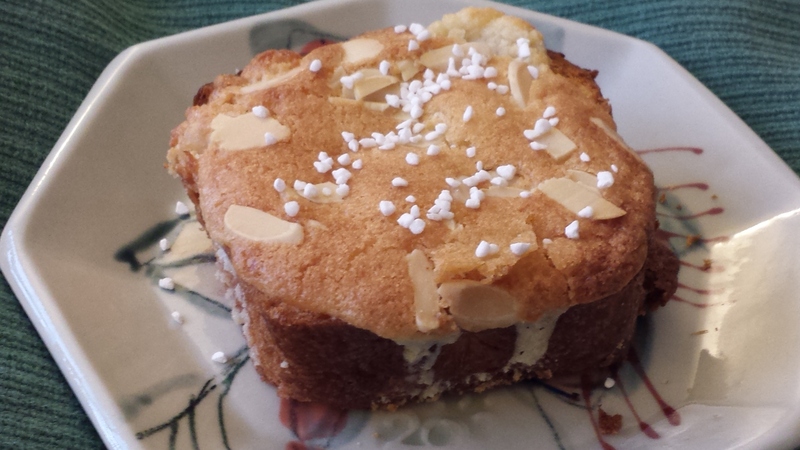 Bostock is wonderful … The brioche version of almond croissants. 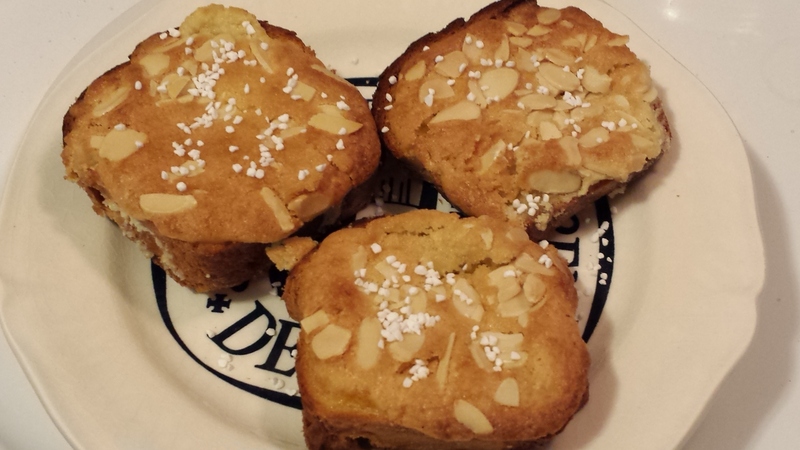 There is also a great recipe for Bostock in the Tartine Bread cookbook by Chad Robertson. The Tartine books sound wonderful. Maybe I’ll be a baker in my next life! I MUST try this! Thanks, Faith. Origin still a mystery to me. Anyone out there know? Faith – Since I no longer subscribe to the Packet, I might not have found out about bostock otherwise. Now I must have some! I have loved this from the first sight, and I am so glad that you have posted a recipe. Please can you advise me on freezing the almond cream? Does it freeze well? Roughly how long can you keep it for in the fridge/freezer? Thanks for your inquiry. I don’t think I’d freeze that, I suspect it will break down when it thaws, but you could always try freezing a spoonful overnight and seeing what happens. You never know, I might be too cautious!